It is Monday today which means New Week – New Opportunities – New Goals. Another busy week on its way. I am having another six days work-week. I am quite happy with everything I managed to complete this week, I know I did not complete 100% but considering everything I am pleased. I talked to a friend of mine on Saturday because I am getting so stressed because I just have so incredible much to do and he made me realise that I will never be caught up. There will always be new things added to my list. I cannot feel bad because I take some time off after work because I am tired. Because then I will just feel worse. I have to be better at deciding that when I take time off, I will not feel bad about it. I can’t work 24 hours a day. Again, it’s about making money online and setting myself up for being able to start making a side income. I have pinned a dozen Etsy articles on Pinterest and I need to read through these and take notes, etc. 2. Open my store and add 10 items. What happens if I only add five things, that’s totally cool. I want to create items with different colour combos, like my to do list and even though it is just listed as one item, with the combinations it’s probably more like 20 or something depending on how many I will make. But the thing is this is just a number, the most important thing is that I open the store and have something in it. 3. Have a big 30% off all items SALE! Promote the store. I have to start getting it out there to the people, I know people love sales so that is a great way of doing it. Also I need to share it in my newsletter and on my Facebook page and probably my Pinterest page and yes. 4. 12 Weeks To Goals – work on daily. This is a new series I am a part of, and it is something I need to work on every day to be able to reach me goals and the end of the 12 weeks. This week is week 4/12. I need to work on getting stronger. I am running colour me rad next weekend actually, wow time flies. I might kinda be freaking out because I totally need another year to get ready. So I did focus on my Epla.no store. I did not add 10 items, but I added the items I could, and I also started writing some listings so they are ready when the items are. All in all I think it deserves one point. I did not have a sale, it is so stupid but there is actually not anything called a sale, like you have to manually change the price and write sale in the product header. But I did post about it on my personal wall and I try to continue to market it via my personal Facebook page, as a store and single items. Half a point. 12 weeks to goals is going really bad. I do not make the time to check it every day, but I do make sure to stop by so another half point. I worked out once in the gym, I was too stiff the second time I was going to so I did not, but I did do a walk in the woods on Sunday so that counts for me, one point. Sell stuff online is something I am still working on, the most important thing is I have started putting some items out there. I need to stop spending money on personal stuff that I want, and only stuff that I need. I buy too much that I end up just never using. I give this one point, I just have to keep up the good work! 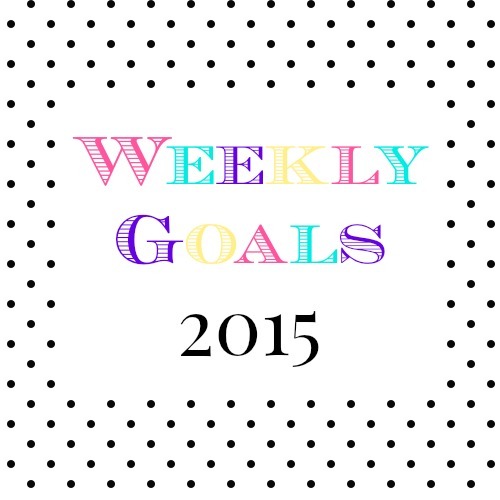 Sign up for my newsletter to receive a free copy of my weekly goals printable!